It&apos;s sunny! It&apos;s hot! It&apos;s time to go to the beach! Dip your toes in the water, or go full force and take the plunge, whether your an adult or a kid. Speaking of kids...while all beaches are family-friendly, there are a few that seem as though they were made solely for entertaining the kids and relaxing their parents. 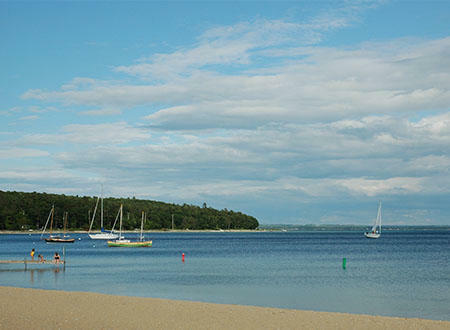 For a family beach day, which I highly recommend you indulge in, here are the top choices for beaches in Traverse City. Bryant Park. 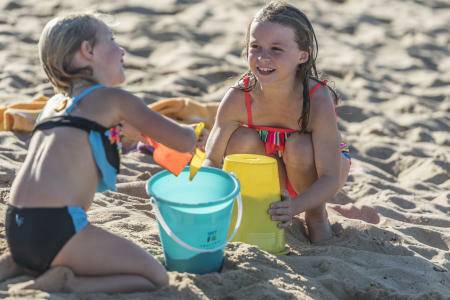 With a picnic area, playground, charcoal grills, restrooms, and lifeguards from mid-June to August, Bryant Park Beach easily makes the list of great places to go with kids in tow. It also has a beautiful view of West Grand Traverse Bay in case you get tired of watching children chase each other (which you probably won’t anyway). And I’m not the only one who think so – TripAdvisor reviewers call it “a great shady park here for the kiddos” and “a lovely gem for Traverse City.” One reviewer, Emily L, was especially enthusiastic, saying that “if you have kids this is the PERFECT beach area,” as it is “easy to keep sight of the kiddos and keep them entertained.” Hard to pass up on that! Good Harbor. Listed as one of CNN’s “10 Secret Beaches Worth Discovering,” Good Harbor Bay Beach is definitely worth a visit – not only does it have beautifully clear views to the Manitou islands, but it’s only a short walk away from a small stream running from the woods into Lake Michigan, which is perfect for kids to play in. It’s also quiet and secluded, so you’ll be able to keep track of the little ones running around without worry. Clinch Park. A local and visitor favorite, this park not only offers snacks and family restrooms but has a small water playground right next to the beach where kids can run in and out of sprinklers and spin around on little swings. Although it would probably be impossible for the view of the West Grand Traverse Bay to bore you, there’s also a kayak rental just in case you’re tired of being landlocked. Beachgoers on TripAdvisor describe this one as a “great place to stay for a minute or a hundred” and “a great place to spend the day with kids” – it’s definitely a local favorite. North Bar. Although it&apos;s a hard contest, this beach is my personal favorite. A short walk through the forest takes you to one of the most peaceful, picturesque lakes I’ve ever laid eyes on, surrounded by little dunes you can climb to the top of to get a good view of Lake Michigan. The lake is just barely attached to Lake Michigan through a tiny channel, where a small strip of beach separates the two bodies of water. 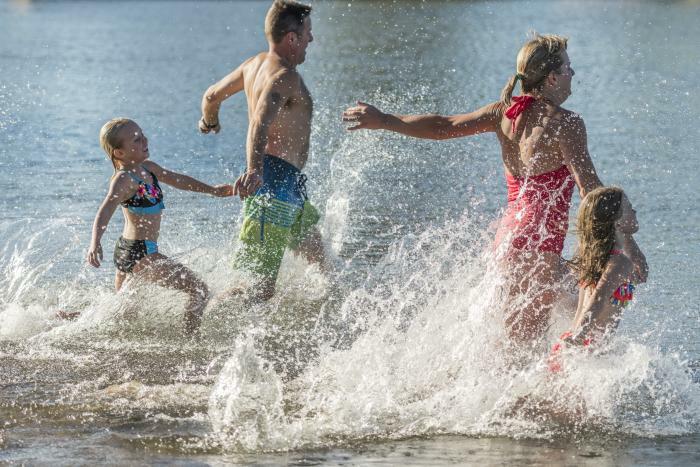 Since the channel is so shallow, the water on North Bar Lake’s side is almost hot, which is a stark (and welcome) contrast to the cold water of Lake Michigan. It’s the perfect place to safely entertain kids for hours, and I’ve heard it’s also a popular skimboarding area. Haserot Park. Another local favorite, Haserot Park Beach used to be pretty secret, and is well-loved for its serenity and beauty. It resides on the protected East Bay Harbor, so it is rarely plagued by too much wind and waves, and although it fills up on the weekends it is not usually very crowded on weekdays. This is enough to get me excited, yet it also has a full playground with slides and swings, as well as restroom facilities. For families looking to get on the water, it also has a public boat launch, so you can alternate between hanging out on the sand and on the waves! Of course, this list is not all-inclusive, and there’s plenty of other beaches that would be great for a family outing. You can also try Van’s Beach in Leland, Northport, and the Traverse City State Park, to name a few. Just don&apos;t forget to bring the sunscreen! Kelly was a summer intern for Traverse City Tourism. She is studying Journalism, Communications, Public Relations, and Business at Indiana University. In her spare time, she enjoys wakeboarding, waterskiing, and swimming in Glen Arbor's Glen Lake, as well as sitting on her porch and drinking coffee. Her least favorite planet is Mercury, and she only likes the red and purple Skittles.